The nice folks over at Carapelli sent over this delicious recipe the other day! 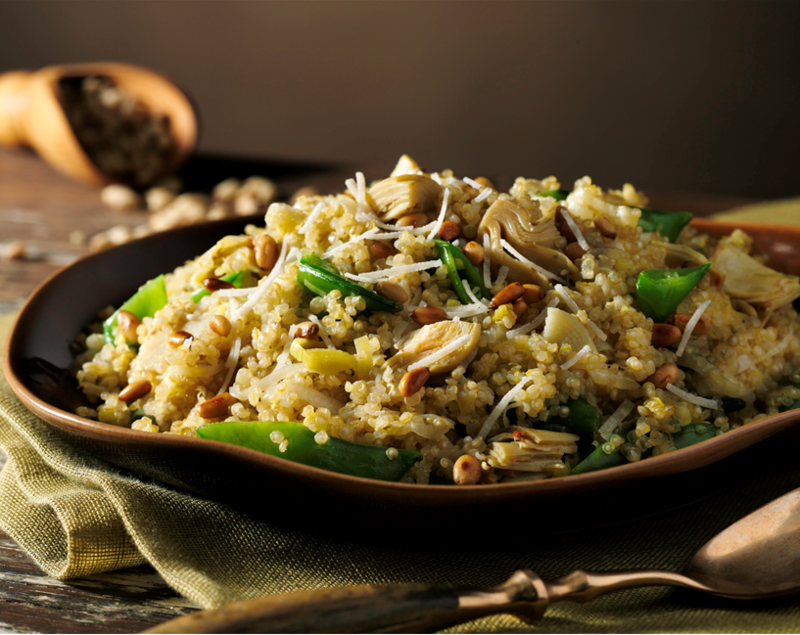 Leeks, quinoa, artichokes and sugar snap peas — doesn’t that just make you want to jump in the kitchen and start cooking this delicious combination?! As long as you use the vegetable broth, it’s vegetarian and gluten free. To make it vegan, just omit the cheese. It’s totally my kind of recipe — easy to modify depending on who is eating it. I’ve been a can of Carapelli olive oils since they sent me a bottle of their organic olive oil last year. A week of cooking with it, and I was hooked. If you haven’t tried it, you absolutely must! And, Carapelli is current offering a printable $1 off coupon on their website. Grab a bottle and then make this tasty recipe — that’s what I did! Heat oil in a large saucepan over medium heat. Add leek; cook 5 minutes, stirring occasionally. Stir in broth and quinoa; bring to a boil over high heat. Reduce heat to medium-low; cover and simmer 7 minutes. Stir in sugar snap peas; cover and continue to simmer 6 to 8 minutes or until most of broth is absorbed. Stir in artichoke hearts; heat through. Top with pine nuts, cheese and pepper. Looks simple, delicious, and healthy. I'm pining this recipe. Please share it this coming Friday on my Foodie Friday linky.